John Lennon's own copy of a Beatles record that caused controversy due to its graphic cover is expected to fetch £136,000 at auction. The so-called "butcher" cover of Yesterday And Today showed the Fab Four covered in raw meat and decapitated baby dolls and was withdrawn in 1966. 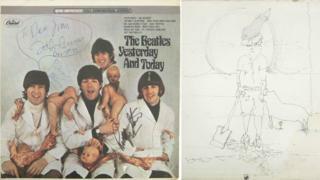 Beatles expert Gary Hein said the album bearing three Beatles signatures was unique in "both rarity and value." The "butcher" cover, taken by Australian photographer Robert Whitaker, sparked outrage upon its release in the US. It was suggested the cover was The Beatles' protest against the Vietnam War. Image caption Other items on sale include a baseball signed by The Beatles estimated to sell for up to £75,000. Lennon had his personal copy of the album on the wall of his The Dakota apartment in New York until he gave it to Dave Morrell, a Beatles fan and bootleg collector. It is signed: "To Dave from/ John Lennon/ Dec 7th 71" and has a sketch Lennon had scrawled on the back showing a man holding a shovel with his dog in front of a setting sun. It also includes autographs by Ringo Starr and Paul McCartney, which Mr Morrell obtained later and it is believed to be the only original "butcher" album bearing three Beatles signatures. Mr Hein said it was an "important world-class pop culture piece" and there "is no Beatles album in the world that compares with this one in terms of both rarity and value". Other items on sale at the annual event run by Julien's Auctions on 9 May include Lennon's guitar strap and school detention record as well as a baseball signed by The Beatles estimated to sell for up to £75,000.